Page 6 – A new comic strip about a library. I’m going to start posting book reviews here in the Library Comic blog 1-2 times per week starting in November 2018. I’ll mostly be reviewing graphic novels, though I’ll also be featuring art books, picture books, and whatever else I enjoy reading. I’m also planning to create a few comics-format (or at least comics-suppmented) reviews like I used to do for the Unshelved Book Club. You can see my recent reviews (with Sarah Hunt! and guests!) at Book Threat, and if you’d like to check in on book reviews on this site, you can use this link. PS: If you don’t see the links in the above, click on the title of the post and you will. Just wanted to say thanks on behalf of Chris and me for making Library COMIC’s first year a success. It’s been a fantastic, surprising year, from our first library conference to our enamel pin Kickstarter to regularly being read by more than 300,000 of you via our website and social media. Next year I’ll be at more conferences, plus we’re already working on our next Kickstarter idea. We’ll probably open an online store at some point, too, and I’ll continue to give keynotes and talks at staff days and conferences. Personally, I’ve had a rough few weeks — a close friend, whom I met at the library system where I used to work, passed away. But his death brought me into the orbit of people I used to work with, many of whom I hadn’t seen for years. It reminded me how much I love the people I’ve had the chance to work with at the library. I hope you’re lucky enough to feel that way about your colleagues, and I hope to meet many of you in the coming year. 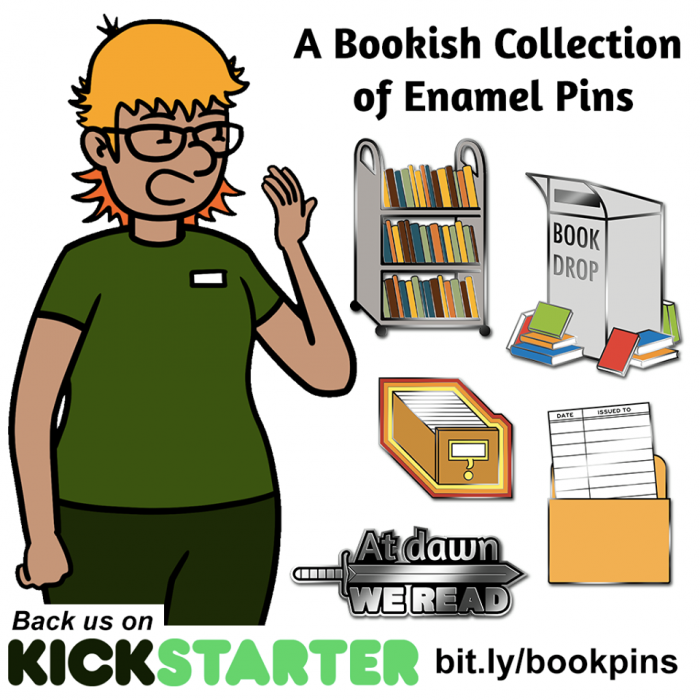 Show your love of reading and libraries and your support for Library Comic by wearing our beautiful, hard enamel pins. Plus we’ve just reached our first stretch goal. Now everyone who pledges at a $25 pledge level or above will also get 5 reader-friendly buttons. A big thanks to all of you who stopped by the Library Comic booth at the American Library Association conference last weekend. Our first conference appearance was a huge success, and I hope you all had a chance to meet some of the other comics folks in the Graphic Novel Pavilion, too. Laura Keys and her husband Robert Kaplafka helped me move in and set up. Laura does live performances as historic women including Mary Todd Lincoln and Laura Ingalls Wilder. 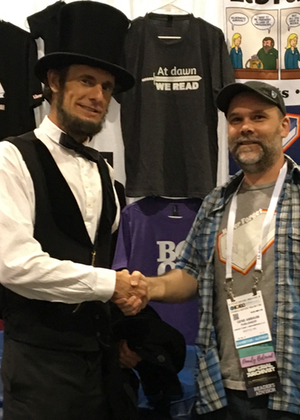 She introduced me to the fantastic Kevin Wood aka Abe Lincoln (pictured above), who joined me at the booth on Friday night. They both do school visits — check out their websites at www.laurafkeyes.com and www.mrlincoln.com if you’re looking to book a great program. I also owe a big shout out to retired speech professor Marlene Atkins, librarian / MLIS student Samantha Mairson, and my gaming buddy Ryan Nolet for going above and beyond the call of duty. Without your help at the booth folding T-shirts, providing caffeine infusions, and giving me time to run to the men’s room, it would have been a tough show. Personal highlights of the show for me included meeting several French graphic novelists, short conversations with Owly creator Andy Runton and Drama / Ghosts creator Raina Telgemeier, and seeing Lynda Barry give the most amazing and indescribable speech ever at Saturday’s Eisner party. Holy crap and wow! Hope you had a great time, too, and that I’ll see you all again at ALA Midwinter in Denver. 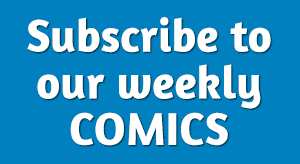 Library Comic will have its first ever booth at an American Library Association Convention in Chicago June 23-26! Gene will be at booth #1321 in the exhibit hall’s Graphic Novel Pavilion. Please stop by to check out our new merchandise, tell him a story, or just to make sure he’s still standing.